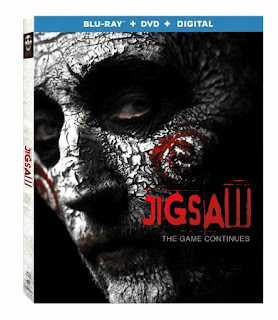 In the latest terrifying installment of the legendary SAW series, law enforcement find itself chasing the ghost of a man dead for over a decade, embroiled in a diabolical new game that's only just begun. Has John Kramer, the infamous Jigsaw Killer, returned from the dead to commit a series of murders and remind the world to be grateful for the gift of life? Or is this a trap set by a different killer with designs of their own? Emily Anderson (TV's "Lizzy Borden Took an Ax"). 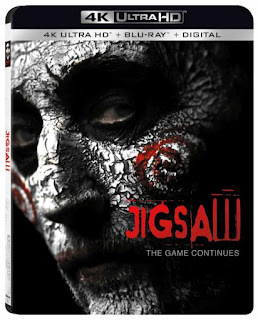 The movie is well done for a sequel to the Saw franchise. It felt a little different in that the gore was toned down a bit. The traps were still cool, the suspense still there and there were a few nail biting moments. Five new people wake in a barn with buckets over their heads and a chain pulling them toward uncertain death until someone confesses their sins someone will die. Throughout the movie I kept thinking wait; what? Jigsaw is dead! Who? How? It wasn't until the big reveal that I figured it all out and it was so worth it. Great ending. I highly recommend Jigsaw even if you have not seen the Saw franchise.